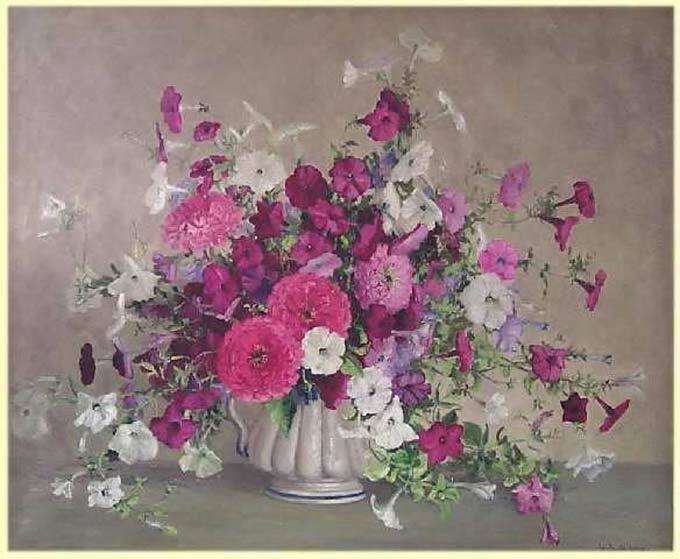 Petunias A Plenty | Kappa Kappa Kappa, Inc.
"Petunias-A-plenty" by Leota Loop is H 30” x W 36" and was purchased in 1944 for $300 and is valued at $6500. This painting is oil on canvas, mutt-colored, multi-floral still life with handled vase in gray with blue borders. This is the 23rd to be restored. Leota Williams Loop was born in Fountain County, Indiana. As a young girl she lived in Elwood and in Kokomo. She studied art with Olive Rush, William Forsythe, and Edward Stizman. From her lovely studio-home in Nashville she gave private lessons and the studio was always open to visitors. She is most famous for her flowers and snow scenes as this painting portrays. Having a green thumb, she enjoyed her garden and all the flowers that she grew there. These were the flowers that she painted so well. She was also a member of Kappa Kappa Kappa. The painting had a slack support, causing a stretcher crease on the top. There was a crackle pattern and small losses in the middle right and lower center. There was no varnish, so these areas were repaired and it was reframed using brass mending plates and a foam core backing.